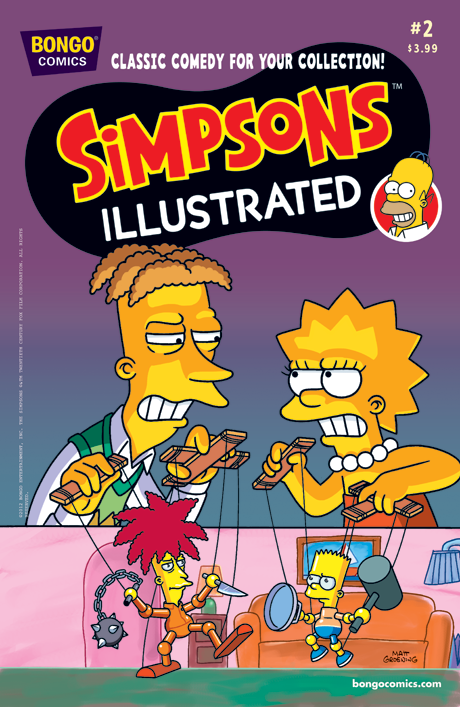 For Simpsons Illustrated 2, released in summer 1991, see Simpsons Illustrated 2 (Summer 1991). Simpsons Illustrated #2 is the second issue of Simpsons Illustrated. It was released on May 2, 2012 in the United States. "Welcome to the next level! This month, when a psychotic clown sidekick comes to town with a plan to exact his revenge upon his archenemy, no one expects that vengeance-seeking harlequin to be Sideshow Cecil, Bob's brother, with a plan to kill his own archenemy - Lisa Simpson! Then, Bart's treehouse gets condemned when the tree in the Simpsons' backyard develops stump rot, and it's up to Bart and Milhouse to stand in the way of the bulldozers. Also, Radioactive Man finds himself in an alternate reality after an emergency stop in a convenient Portal Potty, and Bart tries to avoid getting a flu vaccine." Modified on July 25, 2017, at 08:51.